Marina Center is a mixed-use urban-infill retail, residential and light industrial development that will clean up and restore a degraded parcel of land and create a better environment, community and economy for Eureka. Marina Center's future home is a former Union Pacific Railroad switching, maintenance and freight yard called the Balloon Track. More than 100 years of hard use and 30 years of abandonment have resulted in the Balloon Track’s present state of disrepair, defined as an urban brownfield by the United States Environmental Protection Agency. The 38-acre property is located near Eureka's historic downtown commercial core and connects with its shopping district. 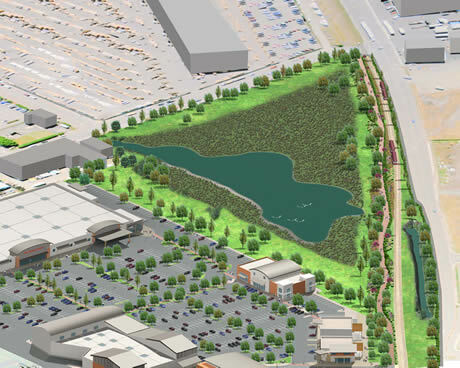 Marina Center will offer retail (including The Home Depot) to meet important community needs, as well as offices, light industrial space, and non-profit organizations. 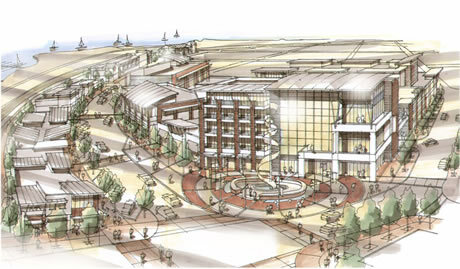 The project will also include recreational amenities such as a Discovery Museum as well as biking and walking paths connecting Marina Center to Eureka's historic downtown. Affordable housing units and a coastal wetlands preserve covering nearly one-third of the total development are additional features. Marina Center was designed by Baysinger Partners Architecture PC, a firm specializing in building high-quality mixed-use projects on abandoned brownfields.